Winter is Here - Come Birding With Us!! Please note a new monthly walk at Hidden Valley – this is a free walk sponsored by the NJDEP Division of Fish & Wildlife. The first walk is schedule for Sunday, December 11th at 4 p.m. - meet at the small clamshell parking lot on the south side of New England Rd., 0.3 miles west of the intersection with Bayshore Road. Hope you’ll join us!! A full spectrum of in-depth and informative Workshops and Birding Breaks are already planned for 2017– Cape May School of Birding. Sign up today to reserve your spot, or gift one to a friend! Check back often for the latest additions to this extensive line-up, as several more are in the works. Of course, for those focused on the quickly approaching holiday season, stop in at the Northwood Center in Cape May Point for all sorts of gifts, perfect for the nature lover in your life – binoculars, scopes, shirts, jewelry, caps, field guides and other natural history books, notecards, feeders, coffee, and more!!!! 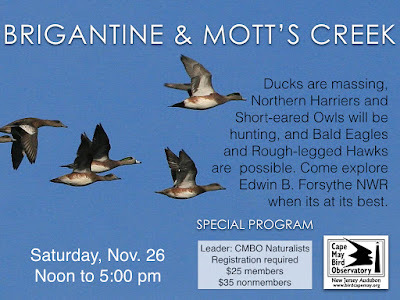 Coming Up: Brigantine & Mott's Creek field trip, November 26th - register now! Making plans for Thanksgiving weekend? 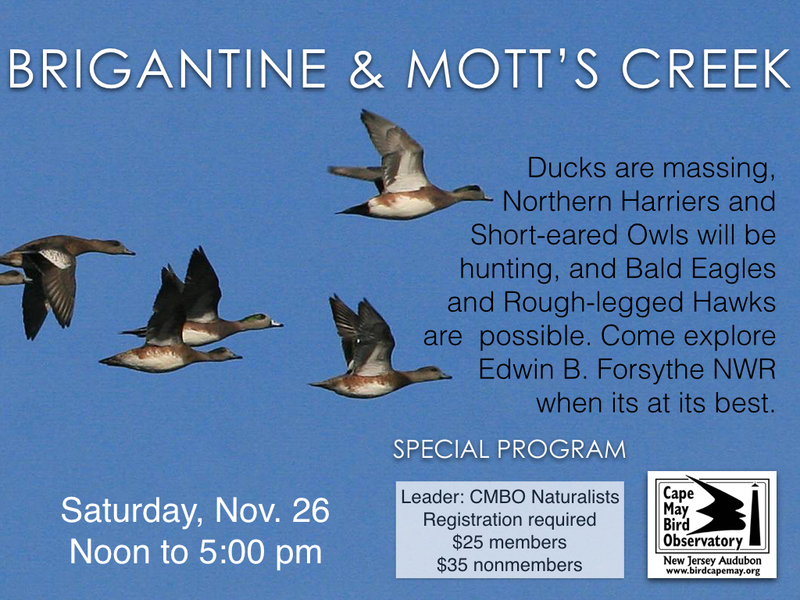 Join Janet Crawford and CMBO Naturalists at Edwin B. Forsythe NWR for a great afternoon of birding. Ducks are massing, Northern Harriers and, perhaps, Short-eared Owls will be hunting. Eagles and Rough-legged Hawks are also possible. At this time, much of the refuge is closed for construction, so after birding the refuge, we will travel to other, lesser known but wonderful sites such as Scotts Landing and Amasa Landing. Then the group will head to nearby Mott’s Creek for raptor watching and perhaps the best chance for viewing hunting Rough-legged Hawks and Short-eared Owls. A refuge pass ($4; can be purchased that day), Golden Age Pass, or federal duck stamp will be required for each vehicle to enter the NWR. Many Eastern birders think of Dickcissel as a bird of the Midwest, and for good reason; their breeding range encompasses much of the United States west of the Appalachians and east of the Rockies. For that reason, recording one along the Atlantic Coast is always exciting. The problem is getting a decent look at one! In New Jersey, Dickcissels are most likely to be encountered in the fall, when they are considered a scarce migrant. As with many species, however, Cape May exceeds the norm. With an average count of about 50/fall, you would think your chances of getting a good look at one, with an acceptable amount of effort, would be high. You would most likely be wrong. Most of these records are flyovers, detected because of their distinctive ‘raspberry’ call, with a fleeting glance the only visual reward. A perusal of reports from Cape May during fall 2016 turns up the expected pattern of sightings. The earliest was in late August, the peak was in the first part of October, and the latest was in early November. Although a total count is hard to determine, due to the possibility of repeat encounters, it is over 50, with at least 6 recorded on 4 October. The majority of these sightings were flyovers, with only a couple seen perched or allowing for a photo. I personally heard at least 8, but only caught a glimpse of 3, as they winged their way past. So where or how do you get a good look? That will require some effort and luck. While the rate of detection is highest at well-known birding sites, such as the hawkwatch platform at Cape May Point State Park, the Morning Flight count at the Higbee dike, or the Coral Ave. dune crossover, they may not be your best bet. Dickcissels are a bird of the grasses and weeds, such as those in the front portion of the Nature Conservancy’s South Cape May Meadows, the fields of the Higbee Beach WMA (including Hidden Valley), or at almost any point along the dunes west of Cape May and surrounding Cape May Point. Patience and a lot of scanning will go a long way to achieving your goal; if not, you can always enjoy the myriad of other birds around you, after all, it is Cape May!